If your dentist tells you that your 8-year-old needs to see an orthodontist, you’re not hearing things. Some children benefit from early orthodontic treatment, which can start as early as age 7. Also known as Phase 1 or interceptive orthodontics, this pre-adolescent treatment can be initiated when baby teeth are still present and some adult teeth have erupted. It is recommended that every child have an orthodontic evaluation by the age of 7 or 8. This review of your child’s teeth, bite, and jaw growth will determine whether they are a good candidate for early orthodontics, like an expander, space maintainer, or tongue crib. Instead of waiting until your child hits their pre-teen or teen years to get them braces, interceptive orthodontics can begin while they’re still in elementary school. When certain conditions are addressed early with orthodontic intervention, it may be possible make future orthodontic treatment easier, faster, and less complicated for your child. It may even be possible that interceptive orthodontics allow your child to bypass braces completely. Most young children have an interesting-looking mouthful of teeth. Some tiny, some large, some present, some completely absent. It may seem like every kid is going to need braces sooner or later. While nature has a way of working itself out for some children and their teeth, other kids need a little more help to get a straight and comfortable smile. Guide jaw bone growth to make room for erupting teeth. Correct improper development caused by bad habits like thumb sucking. Minimize risk of damage to protruding front teeth. Improve biting, chewing, and teeth function. Early orthodontics may even make it possible for your child to be a good candidate for Invisalign braces when the time comes to fully straighten their teeth. And any opportunity for a kid to get straight teeth without being called a brace face or metal mouth will be a welcome option. 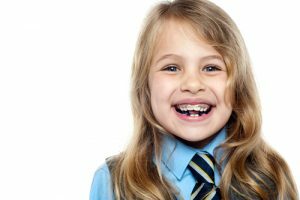 Is My Child a Candidate for Early Orthodontics? You may know just by looking at your child that their teeth are going to need braces in the future, but only your orthodontist can tell you for certain whether your child would benefit from interceptive orthodontics. Children with open bites, deep bites, cross bites, overbites, crowding, missing teeth, spacing issues, or teeth that erupt in the wrong place can all be candidates for childhood treatment. Addressing dental development when your child’s teeth are still falling out and coming in may seem counterintuitive, but this high-growth period is an ideal opportunity to change the future. Ideally, early orthodontics can prevent an alignment problem from developing at all, or stop a problem before it becomes severe. If you can avoid a more in-depth – and costly – intervention later, it’s worth considering interceptive orthodontics now. Do understand, of course, that if your child is a good candidate for interceptive braces, this effort does not indicate that your child will avoid braces forever. If the treatment is appropriate at elementary-school age, the effort can simplify or expedite a course of braces in the future. You don’t have to say yes to early orthodontics, but your Center City orthodontist will let you know all your child’s options so you can make the best decision now, for later. Learn more about youth braces and interceptive orthodontics by scheduling a consultation at Roberts & de Marsche, the orthodontic practice that serves the Center City, Philadelphia and Lawrenceville areas. Can My Teen Wear Invisalign?